Josie was frustrating the heck out of us last night because she was way more interested in "making a masterpiece" with her food than eating it. We finally gave up and let her continue because she was adamant that she had a plan and wasn't just making a mess. 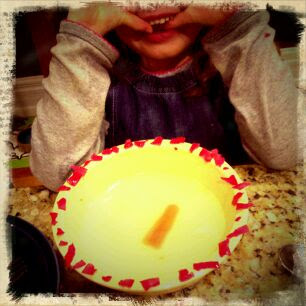 So using water poured into her bowl, a steamed carrot & a bunch of pieces of wax from some gouda that she tore into tiny bits, she declared her masterpiece complete! We asked her for the title and she announced, "It is called Clockwise!" Yea, so from now on, playing with your food is totally alright with us.